Posted by grhomeboy in Arts Exhibitions Greece, Fashion & Style, Lifestyle, Shopping. Solid silver. A ring by Grammatiki Romantzi, part of the ‘Dazzling Garden’ group show at the Eleni Marneri Creative Gallery in Athens. The jewelry exhibition features works by students of the Vortex Studio. Eleni Marneri enjoys giving space to those who have something to say, with jewelry. In the last few years, she has turned the Eleni Marneri Creative Gallery into a home for off-the-gold-beaten-track creativity. “Dazzling Garden” an exhibition which opened at the Fokionos Negri gallery earlier this week, showcases works by a group of pupils and their teacher: Katerina Iliopoulou leads the aspiring designers, all of whom attend workshops at the Vortex Studio in Athens, working on handmade pieces based on metals. A graduate of London’s Guildhall University, Iliopoulou has participated in numerous exhibitions in Athens and London. At the gallery, the team effort is showcased through individual vision: Using primarily silver, gold-plated silver and semi-precious stones, among others, the 20- to 30-year-old students are presenting their debut collections, with prices ranging from 60 to 450 euros. Ioulia Galeou showcases “Cities of Imagination”, a collection of geometric designs featuring a minimalist flair, where pieces include bold, gold-plated little finger rings. Next to his design sketches, Yiannis Galatis presents “Treasure Boxes”, a series of three-dimensional pieces from which gems seem to pop out; Myrto Mazmanidis’s postmodern mosaics feature gold-leaf techniques where minute artworks are framed in liquid glass and where patchworks are created through combinations of silver and leather. Alexis Papapetrou’s “Bodyguard” collection of someone-to-look-after-you pieces present gold-plated human figures, sprinkled with a sense of humor, while in Maria Rizou’s “Metaldance”, the traces left behind by tools turn into motifs on the metal. Through the use of solid silver, Gramattiki Romantzi’s fluid pieces are defined by their “Liquid Thinking”, turning into a study on pleated fabrics via oxidized silver techniques. Lastly, Iliopoulou presents “Elements”, a series of pebbles made of silver, subsequently mixed with copper and gold, creating metal waves as inspired by the world of the sea. Coming up at the gallery next month is a study on water, through an exhibition of works by members of the Jewelry Art Workers group. Marneri’s passion for all things creative also led her to the establishment of the next door Bebe Gallery, a space for selective babywear, toys and an assortment of accessories for the very young. According to Marneri, the children’s gallery is developing into an interactive area which will include storytelling sessions, for instance. Currently on display at Bebe Gallery are children’s garments by Ekyog, an innovative French company specializing in organic cotton; a collection by London’s Caramel Baby & Child; a series of cuddly, knitted toys by Anne-Marie Petit made in the Netherlands; colorful, elaborate knits by Sophia Digard; amulets by Maria Mastori; a funky series by artist Olga Mergou, who incorporates Yiannis Ritsos verses in various objects; handmade crosses by artist Calliopi, as well as ideas for original christening outfits, such as Empire designs by Vasso Consola. Eleni Marneri Creative Gallery, 3 Agathoupoleos Street and Fokionos Negri, tel 210 8668195. “Dazzling Garden” runs to October 30. Posted by grhomeboy in Fashion & Style, Lifestyle, Shopping. Gold-plated silver necklace, among other, designed by Mini Dougeni, the creative force behind Arcana, a boutique with handmade, original jewelry by mostly Greek designers are on display. The secrets and hidden language of gems and metals: This is the idea behind the name Arcana, an attractive, inviting boutique with handmade jewelry by mostly Greek designers. Owners Evi Dougeni and her sister Mini, herself a jewelry designer who has been trained in jewelry-making techniques, opened the business a year ago, with the objective of offering the public unusual designs, well-crafted jewelry and customized service. Large, impressive pieces made of mostly semi-precious stones and silver are typical of the jewelry to be found here. Necklaces made of aquamarine, amethyst, lava, onyx, are interesting both for their form and color. Some are combined with metal: in a necklace designed by Mini Dougeni, a silver yin-and-yang shape embraces each side of the necklace’s rounded, white onyx stones. The philosophy is that jewelry should not go unnoticed. Evi and Mini Dougeni believe that what is chic should not be neutral but should have a distinctive personality. More than anything, a piece of jewelry should bring out the individuality of the wearer. Avoiding ostentation is another principle in Arcana’s jewelry. Mini Dougeni, for example, prefers the modesty and “esoteric” symbolism of silver over the value of gold. Her specialty is working with different metals and techniques. 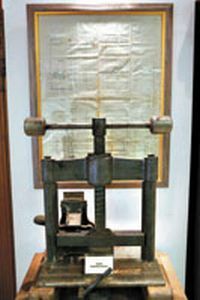 An example is a Mexican lamination technique which Dougeni has used to produce striations of bronze metal on silver. Her style employs mostly geometric, minimal forms but also evokes surrealism and art nouveau. Each designer represented at Arcana works in a different style. Angelos Koutsouveris combines 18-carat gold with brilliantly cut diamonds. Black lava spheres enveloped in a web-like structure of gold wires form a set of pendant earrings. Marina Zahou’s creations appear light and airy. Figurines made of silver or 18K white gold are a recurring motif in her work. German designer Petra Meiren works with large metal surfaces and makes pendants of gold-plated motifs and chains from PVC. Diverse materials such as feathers, beads, metal and stones are combined in other jewelry. At a time of mass production and standardization, Arcana is a haven of jewelry with distinctive personality. The friendly and customized service complements Arcana’s philosophy and adds to the rarity. Arcana Boutique, 10 Alopekis Street, Kolonaki, Athens, tel 210 7238546. Mary Schina’s installation is currently on display at the Macedonian Museum of Contemporary Art. Flowing silk banners depicting the Greek sea and light are suspended in a hall of the Macedonian Museum of Contemporary Art. Artist Mary Schina’s silk prints highlight the size and depth of her new installation, presented to the public for the first time. The installation, titled “Aegean Sea – Light and Colors” is the second part of the trilogy “Aegean Sea – Archaic Writings” which started seven years ago, to track the artist’s switch of subjects from nature and the countryside to the sea world. The work seems very striking as it stands among the other prints of the museum’s new permanent collection, “Prints” with its clear blue colors and the reflections of the white light of the Lesser Cyclades islands. The artist went through various experimental stages and tried out different techniques to reach this result. She first made woodprints, photographed them and then printed them enlarged, digitally, on large silk prints at least 2.5 meters long. The process was not so simple and Schina even traveled to China to find the precise silk that would best bring out the surface of the sea. The concept of an art adventure into the depths of the sea had its roots in Schina’s childhood. The idea for the trilogy came almost naturally. Three exhibitions of paintings and prints made up the trilogy’s first part, titled “Aegeis” the primeval area of the Aegean Sea. The third part will feature symbols from the Phaestus discus, writings on clay and prints that harmoniously coexist with the surface of the sea. Macedonian Museum of Contemporary Art, 154 Egnatia Street, Thessaloniki, tel 2310 240002. “Prints” is open 9.30 a.m. to 2 p.m. and 6.30 p.m. to 9 p.m. Tuesdays to Saturdays as well as 11 a.m. to 3 p.m. on Sundays, through October 14. Posted by grhomeboy in Arts Museums. An assortment of medicines, ointments, furniture, utensils and other related products, dating as far back as the early 19th century are pictured yesterday on one of hundreds of shelves in Thessaloniki’s new Pharmaceutical Museum. Established by Thessaloniki’s Pharmaceutical Association, the new Museum also contains original antique furniture from Greece’s oldest pharmacies. Among them, the display of Zafirios Sfyras’ “Elafos” pharmacy in Volos, which was manufactured in Paris, France in 1889. The new Museum, the first of its kind in Greece, will be inagurated tomorrow Saturday at 7 in the afternoon. 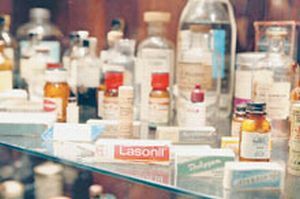 Thessaloniki’s Pharmaceutical Museum, 173-175 Ethnikis Amynas Avenue, Thessaloniki, tel 2310 275791. Visiting hours 9 in the morning to 2 in the afternoon, free entrance. Olympiakos’s long-awaited first away victory in the Champions League, a 15-year-old competition, on Wednesday night, a 3-1 win at Werder Bremen that ended a 31-match rut, also heralded other noteworthy facts for the record. It was the Piraeus team’s first ever win in Germany, on a day marking German Unity Day, and fourth in total by any Greek team. Wednesday’s win also increased the consecutive number of European club-level triumphs by Greek teams to seven. With Panathinaikos already through to the UEFA Cup’s group stage with double victories against Artmedia for a 5-1 aggregate score, the country’s four other hopefuls, AEK, Aris, Larissa, and Panionios, were scheduled to vie for UEFA Cup group berths late last night, having won their first-leg games. Olympiakos’s win at Werder Bremen took the Greek club to top spot in Group C, tied with Real Madrid, with four points from two games. The Greek team meets the Spanish co-front-runner in its next two Champions League encounters, first in Madrid on October 24 and then at Karaiskaki Stadium on November 6. Should Olympiakos manage to garner any points from either of these two mammoth tasks, the Piraeus team will stand a genuine chance of advancing to the Champions League’s next stage, from a group deemed to be one of the toughest. Surprisingly, Werder Bremen lies last in Group C without points. Italy’s Lazio is third with two points following draws against Olympiakos at Karaiskaki Stadium and Real Madrid in Rome on Wednesday. Hugo Almeida gave the Bundesliga club the lead in the first half but midfielder Ieroklis Stoltidis, voted the Man of the Match, leveled relatively late, in the 73rd minute. Then, nine minutes later, defender Christos Patsatzoglou thundered in a deflected shot from 30 meters to put Olympiakos ahead. Connecting with a loose ball, substitute Darko Kovacevic, whose entry into the game on 72 minutes helped swing the game in favor of Olympiakos, sealed the 3-1 victory three minutes from time with a delicate touch over fallen keeper Christian Vander, a tournament newcomer. Olympiakos keeper Antonis Nikopolidis denied Werder Bremen several times with brilliant saves. Conference tourism, one of the best branches worldwide for attracting foreign currency, has huge growth potential in Greece, the International Congress and Convention Association (ICCA) suggests. The association’s data show that Greece can rise to 15th position internationally in hosting top conferences, obtaining a 2.1 percent share of the global conference market by 2017. Already in the last decade there has been a major increase in the number of visitors through conference tourism. In 2005 a total of 78,347 delegate-visitors were hosted in Greece, effectively quadrupling in just 10 years. In 1996 the corresponding figure did not exceed 18,500. One of the branch’s greatest advantages is that conferences are held throughout the year, while the peak months are June and September along with the winter ones. The global conference market, according to a report by the World Travel and Tourism Council, generates around $90 billion in Europe and $482 billion internationally. According to Bank of Greece data for 2001, the annual turnover from conference tourism stood at 184 million, representing 10 percent of the figure for tourism as a whole. This percentage is very high when considering that in 2001 conference and professional tourism was in its early stages in terms of investment and promotion and related in effect to the period leading up to the 2004 Olympic Games. Ideal weather conditions, unique natural beauty, excellent cuisine, high-level hospitality, night entertainment, the feeling of security and the cultural and historic heritage across the country. Modern infrastructures and well-organized, modern hotel units, especially in Attica, Thessaloniki, Halkidiki, Alexandroupolis and other destinations in mainland Greece and on the islands. Greece has outstanding conference centers in popular destinations such as Rhodes, Crete, Athens and other destinations. Posted by grhomeboy in Food Greece, Shows & Conferences. The first Greek milk and cheese Festival opens at the Peace and Friendship Stadium in Neo Faliron today, running through Sunday. Visitors will have the opportunity to taste many relatively unknown types of cheese and watch traditional cheesemaking. The festival will also feature a cheese competition, as well as mini-conferences concerning the problems faced by Greek animal farming and the latest developments in milk production and processing. These will include a conference today on the development and promotion of the Greek animal farming sector and the prospects of strengthening its competitiveness in the Greek and foreign markets. Tomorrow, there will be a briefing event for consumer associations on feta cheese. Some of the largest Greek dairy industries have been under investigation on charges of forming a price cartel and an official report is expected soon.